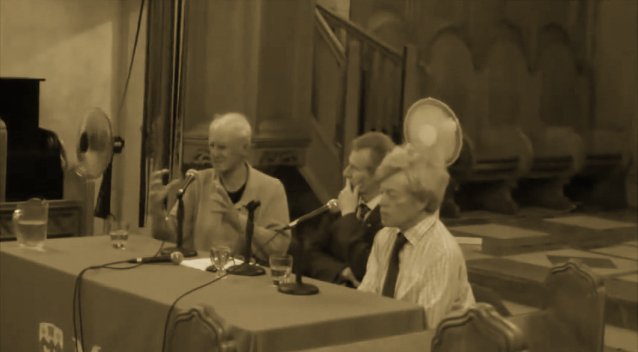 In 2014, McGill University hosted a panel discussion with philosophers Charles Taylor and Roger Scruton on the sacred and the secular in modernity. The panel discussion took part within a broader conference titled Thinking the Sacred with Roger Scruton which had examined the ways the secular has been shaped by the sacred. The central question this particular panel was concerned however was whether a secular public sphere could continue to regulate and find within itself shared ethical sources without public religious expression, and if not, how should it respond to religious identities and what kind of place should these have in secular modern society. For Professor Taylor, we see a shift 19th century in the West from societies that were basically confessional in nature, where the religious and the secular were deeply interwoven, toward societies that become characterized by growing diversity and awareness of this increasingly built in and expanding diversity, primarily driven by immigration and dialogical changes between worldviews. Thus, we can see now that there are two contemporary successors to these previous confessional type of societies: the first is a holding of diverse views within each individual; the second is still the affirmation of religious identity and confessional but as a political identifier for a unified society. What we are left with undoubtedly the end of Christendom in these western societies, which refers to an age in which Christianity was so interwoven with everyday secular life, the end of this type of society, is not only an opening of new plural horizons but unfortunately also a negative inheritance of its past as a condition for political unification. We can see emerge on the one hand a movement that wants to take pluralism seriously, requiring state neutrality, “the neutral treatment of religion between religion along with maximum freedom of possibility for people to practice or expression their views and so on” — an open secularism; while on the other hand, a movement towards looking back at how religion used to unify societies and its expression as a condition for unifying secular communities — a closed secularism. Professor Scruton however, apart from when he is I think peripherally agreeing with Professor Taylor, offers contrasting contending theses, primarily three thesis that have some rigor to them. First Professor Scruton will argue that the development of the obligations and relationship of citizenship, while open to everyone of any faith, occurred in a world where Christianity was particularly prevalent and still is in some sense genealogically underpins the intellectual, moral and spiritual sources of the view of the human person. He also make an alternative contending distinction within open secularism, that is between a flattening secularism, where religious expressions are excluded from the public sphere, and reasoned secularism, where religions diversity is permitted to express and justify itself amid a diversity of expressions. And finally, he raises concerns over the loss of the heritage of having single territorial sovereignties in light of what I think he mistakenly see as the kinds of concessions and relativism of pluralism and the philosophical importance of maintaining a dominant role of Christianity in underpinning the secular traditions that have emerged from it. There are other points that Scruton raises that do not have any philosophical relevance, appropriateness or rigor to them, and for these reasons I will not discuss them here. For Professor Taylor, the first thesis is not as convincing as it may seem once we examine the emergence of modernities across the different cultures and civilizations noting in particular those emerging in Senegal and India where the traditionally expected (read as western) trajectories have not been exactly replicated particularly in regards to democracy, religion and disenchantment. While there is something of substance however that can be said by looking at the intellectual and spiritual sources that define the human person in tracing the development or perhaps a particular strand within a conception of modernity in a particular society, Professor Taylor seems to take issue with the exceptionalism and reductionism of this thesis and the other two. Cultures have always exchanged and lived interactively with one another. There are and always been a diversity of sources of legitimation for any issue, whether human rights or another, that challenge the picture that the world is or should be necessarily one of cultures engaged in political struggles. In Canada, for instance, democracy has become interwoven with the Charter of Rights, a fundamental assumption that must be accepted, which provides rights equally to all member of society, where the challenge has been in fact the need to overcome the tendency and inner biases that allow us to interpret these rights in ways that makes it difficult, if not impossible, for people who do want to collaborate with us to live out their lives and religious selves. An important element in having a chance of working in living with each other is to have curricula and reasoned dialogue where the prejudices and the ignorance about others can have a more difficult time in gaining any head way. We do not think in Canada that someone should translate and censor their religious expression in the public sphere in the way that Professors John Rawls or Jürgen Habermas had originally advocated. Both professors Taylor and Scruton however disagree on the philosophical point on whether historically inherited religious expressions are in the west necessary expressions for the state in order not only to maintain social unison necessary for democracy but also preserve the territorial sovereignty and other traditions out which they have emerged.